What is the exact meaning of colors of ways in JOSM. I presume they are different types of errors. I have some red ways as well as some muticolored ones - one is yellow, blue, green for example. I think it might be some sort of checking for errors. Please check the map styles you have activated (bottom most symbol on the left). It shouldn't look like that, if you have just the default style activated. @Bastik that was it! Thanks - I have activated "osmc hiking" by mistake. If you post it as your answer, I will be happy to accept it so you get the credit. Colored ways in JOSM are not errors, they are just a result from the tags (unless you are using some specific tools like the validator or license change plugin, of course). The current color settings can be viewed/configured at Edit->Preferences->Display Settings->Colors. In non-wireframe mode a yellow way might be a way tagged as barrier=*, blue usually is some sort of waterway or a service way and green a footway or path. Multi-colored ways are for example combined foot/cycle ways, living streets and roads with a cycleway lane. I do not think it has anything with type of the road. 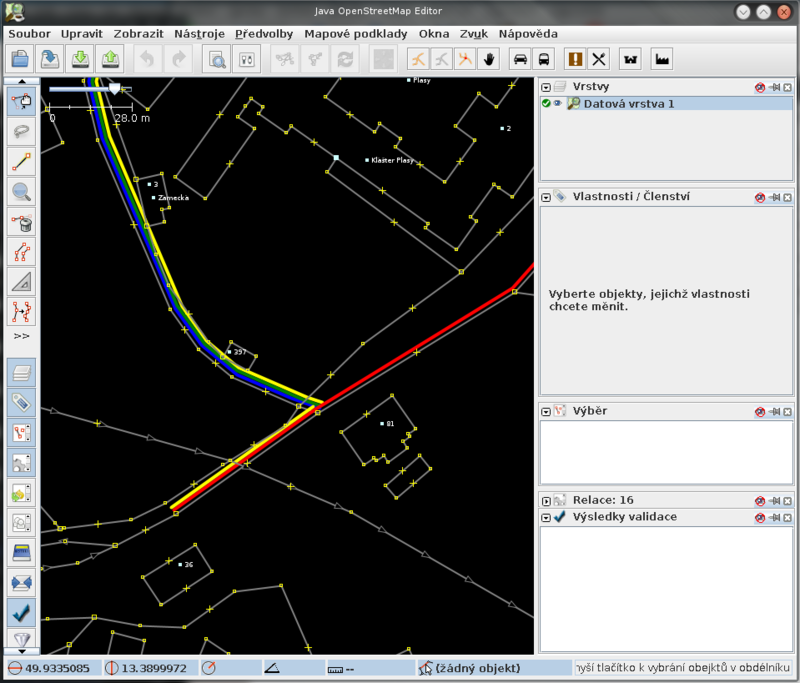 Some tracks are coloured and some other with identical properties not. It seems to me that I have no plugin enabled, but yes, I have been saving the project and there is always some sort of checking and I have the "errors" dock visible. The area in question is here (better post a permalink next time). It seems that those colored ways that look like barriers/hedges/waterways indeed result from the validator as there are no such objects in the database. However, my validator doesn't show them and I have no idea why it draws colored ways next to the original ways instead of highlighting those ways which would be the usual behavior. Might still be some other plugin or you added those ways yourself. Can you select them? What tags are on them? Sorry thought that someone will know the answer without looking at this particular place - i will edit the question with exact permalink in few minutes. The ways are normally editable, the parallel coloured ways keep moving with them. Tags are very different - some of them have just highway=residental, some of them have many tags. You can have a look in josm.